I blogged several times on the successful use of mobile marketing in Obama’s election campaign. In fact, it’s been praised as a great example of the possibilities of mobile marketing on many international sites and blogs. One would think many would follow his example, right? After all, Obama proved the many advantages of using SMS and Mobile Internet in a campaign: it’s fast, you reach a lot of people, you prove to be into modern technology, and it’s a great way to build in interactivity and people involvement. So instead of sticking to those lame (and expensive!) billboards in people’s gardens, Belgian politicians and parties have had developped their own mobile site with their political program and the latest news. They have offered SMS alerts to remind voters what they stand for. They have held collects by SMS payment to fund their campaign among party members. At least, that’s just some of the things they COULD have done. But we have seen none of that appear. The cliché of the Belgian who sticks to the old, to what he knows, has once again been confirmed by our very own political figures. Instead of showing their progressive side, stimulating innovation in Belgian business, they’ve chosen to play it safe. No social media were used either. Several international examples have recently adopted social networks such as Facebook, Twitter and YouTube with big success. Apart from some local initiatives and Facebook fan groups, we’ve seen nothing of that either in the Belgian election campaigns. PS: I forgot to mention one of the exceptions: CAP (Comité pour une Autre Politique) uses a SMS Payment service to fund their election campaign. Big thumbs up to them! At his inaugeration yesterday, US president Barack Obama promised Change. One change that he has already implemented since the start of his election campaign is his embrace of modern technology, in particular the Internet and Mobile Marketing. We already reported on this blog before how he successfully incorporated SMS Alerts and a Mobile Internet site into his campaign. In the past few weeks, it was often reported in the press how Obama refused to give up his Blackberry, because the device gives him so much flexibility. Even after his election, the use of mobile marketing remained. Supporters could receive information on inaugerational events by text message. The mobile site offers many options and a separate application offers iPhone users one-button access to campaign information, volunteer, and donate time or money, among other things. The name of the vice-presidential candidate Joe Biden was first announced by SMS to more than 2.9 million mobile subscribers, which makes it the largest mobile marketing campaign to date. While in the past year many companies realised the opportunities offered by mobile marketing, there was still a lot of scepticism in the market. Obama could give a serious boost to the industry. His campaign has already proven the wide variety of possibilities that are offered by mobile services. Compared to more traditional direkt marketing channels, such as e-mail marketing, mobile marketing represents an immediate call to action – avoiding the need to boot up a PC and often even eliminating the need for log-ins or other impediments to successful engagement. Mobile also represents a personal, nearly instant, way to reach people since most people carry their phone with them all the time, and consider it an integral part of their daily lives. 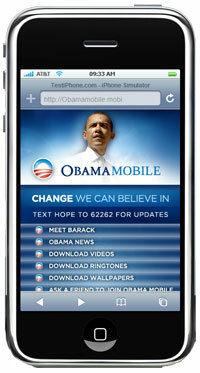 Obama’s mobile strategy combined text messaging with an easy to use mobile site supported by mobile banners. Given its high success rate, we should see more similar campaigns in the business world in the weeks and months to come. If the president of the United States shows that mobile marketing works, that sure is the best prove for the industry. We always see a big increase in the volume of mobile messaging on New Years night and during important events. One of those was the recent election of the next US president Barack Obama. In the 10 minutes following the official announcement, the SMS traffic grew to three times the average. According to Sybase 365, US subscribers transmitted more than 1.2 billion text messages between 7 pm and midnight that Tuesday night. Looks like mobile messaging isn’t really affected by the economic crisis. A study by ABI Research has shown that SMS traffic growth is not exactly slowing down these days. Expectations are that worldwide mobile messaging services revenues will increase from $151 billion in 2008 to more than $212 billion by 2013. A growing number of customers see mobile messaging as a more efficient means of communication than voice services. The election of Democratic candidate Barack Obama as the new US president will stimulate Internet & mobile technologies. Obama’s openmindedness towards these new marketing channels already became clear during his election campaign, when he launched a popular mobile internet site and news alert services by SMS. This past summer, Obama was the most searched term on mobile, more popular than rival keywords Heath Ledger, Britney Spears and American Idol. New media, such as internet and mobile, have played a very important role in this presidential elections. “Like Kennedy used the television to his advantage in his 1960 battle with Nixon, Barack Obama has won these elections through his knowledge of the Internet and other new media” says Mark McKinnon, political adviser of George Bush and John McCain. As McKinnon states, Obama’s campaign worked bottom up instead of top down. He reached voters who no longer depend on getting informed by television channels and newspapers. Instead, his platform included YouTube videos and SMS messages. The results have proven the impact these new media can have on a campaign. If Obama continues his affinity to the internet and mobile platform, it promises great opportunities for these markets. In May, we already reported how the US Democratic presidential conadidates use SMS Marketing for their voting campaigns. Barack Obama is further using Mobile Marketing strategies. He has now launched the mobile site Obamamobile.mobi (also available at m.barackobama.com), where voters can ‘meet Barack’ and download videos, ringtones and wallpapers. Users can also check out the latest Obama news, recommend the site to a friend (and send them a ‘message of hope’), download the War In Iraq whitepaper and register for mobile alerts. Next up with election-themed mobile stuff will be Motorola with its much-anticipated Votr handset. To make sure they reach a broad audience, the US presidential candidates have added a mobile marketing component to their election campaign. Judging from his website, Barack Obama is clearly most into it. You can “join his movement” and stay updated about his campaign, by texting “go” to the shortcode 62262 (the number corresponds to the letters of his name). There are specific keywords (health, education, iraq,…) to receive info on his policy on specific topics. His website also offers free wallpapers and ringtones for your mobile phone. Hillary Clinton doesn’t stay behind either, although her website only offers a subscription form “to receive text messages from Hillary Clinton”. Not very clear what to expect there.